Wouldja look at that, it’s my birthday! In celebration of Me, here’s The Morning Shift for you. Happy Valentine’s Day! Everyone’s sales were shaky at best last year, except for Subaru’s. 2017 was actually Subaru’s best year for sales in its 50-year history. That might be coming to and end, though. 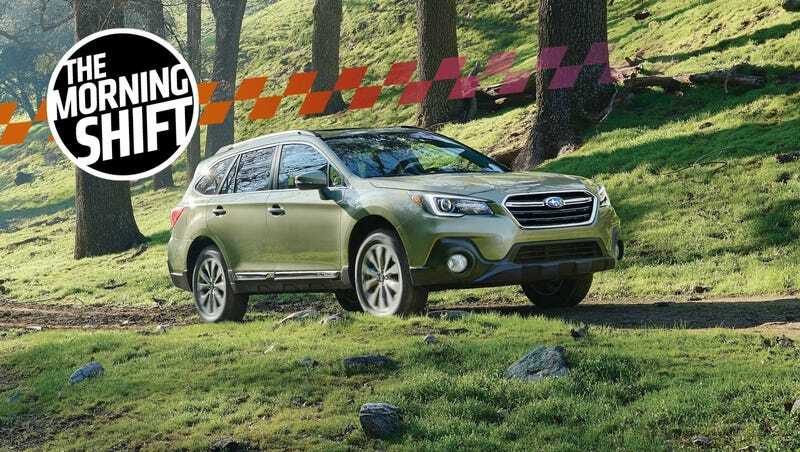 Part of what boosted Subaru sales so well was the company’s willingness to offer cheap financing on the Outback and the Legacy, even as federal interest rates rose. And continually rising rates are really starting to put the squeeze on the company, as well as the industry as a whole, according to Bloomberg. “Our basic incentive programs haven’t really changed — what’s changed is the fact that interest rates have increased so much,” Tom Doll, president of Subaru of America, said in an interview last week at the Chicago Auto Show. With the Fed hiking rates three times last year and forecasting three more in 2018, carmakers are coming under pressure. So far, they’ve been wary of backing away from cheap financing offers, which could cost them market share as U.S. auto sales stop growing. At some point, the cost of dangling those deals to consumers will sacrifice too much profit, according to Doll. It sounds to me like if you’re still thinking about picking up a new Subaru with a cheap financing package, you’d best do it soon. If it’s a face-off between Subaru and the Feds, my money’s on the Feds coming out on top. Good things really do come to an end. In order to make electric cars more affordable and attractive in China, the government has plied its citizens with electric car incentives. The latest one rewards electric vehicles that have longer distances per charge, per Bloomberg. The central government incentive for electric cars that have a range of 400 kilometers (249 miles) and beyond on a single charge has been raised to 50,000 yuan ($7,900) from 44,000 yuan, the finance ministry said in a statement dated Tuesday. At the same time, vehicles have to be able to go at least 150 kilometers on a single charge to be eligible for incentives, up from 100 kilometers previously. As the biggest car market in the world, China has also implemented some of the most aggressive new-energy vehicle regulations of any country, which demands that automakers include at least 10 percent of NEVs in their offerings by 2019 and rising to 12 in 2020. In the wake of Takata’s U.S. settlement, a group of 13 carmakers will put forward as much as $130 million as compensation for those injured by the faulty air bag inflators, reports Reuters. Honda will be shielded from further lawsuits. That also means it will not face the risk of punitive damages. The other automakers have 18 months to agree to the trust if they will also fully compensate drivers. As mentioned above, China is pushing fiercely for EVs on its roads. And as Tesla is the highest-selling electric automaker here in the U.S., you’d think it’d be big in China, too, right? Sure, if prices stay competitive, which is where a Chinese Tesla factory would come in handy. Back in June, Tesla said that was looking into investing in a plant in Shanghai, which would help it avoid a 25 percent import levy. Yet, it’s now February and Tesla CEO Elon Musk still can’t seem to close a deal on said factory, according to Bloomberg. More than seven months after Tesla said it was working with Shanghai’s government to explore assembling cars, an agreement hasn’t been finalized because the two sides disagree on the ownership structure for a proposed factory, according to people with direct knowledge of the situation. China’s central government says the plant must be a joint venture with local partners, while Tesla wants to own the factory completely, the people said, asking not to be identified because the negotiations are confidential. Currently, all foreign automakers must partner with Chinese companies in order to manufacture locally. Gaining a foothold in China is extremely important, especially now, Bloomberg points out. A powerful buying power, coupled with generous government incentives, makes China the ideal market for an electric car-only automaker, especially if it wants to stay competitive against the Chinese companies. Currently, Teslas are subject to a 25 percent import tax. It’s unclear what Tesla’s plans are for China, as it wasn’t mentioned during the earnings call on Feb 7. Remember that freaky, scary Lexus UX Concept we saw last September? Word from Automotive News Europe is that the production version is coming to the Geneva Motor Show next month. I kind of hope that it will still look terrifying. As a competitor to the BMW X1, the UX will be built on Toyota’s TNGA platform, the same one that you’d find in the C-HR compact crossover. And! It won’t be built in Europe. Lexus denied that. “We have no plans at the moment for production in Europe,” a spokesman told Automotive News Europe. All Lexus models for the European market are currently built in Japan. Sakichi Toyoda, whose textile machinery company spawned the Toyota Motor Corporation, is born in Japan on February 14, 1867. In 2008, Toyota surpassed the American auto giant General Motors (GM) to become the world’s largest automaker. Neutral: How Much Does Cheap Financing Affect Your Car Buying Decisions? How much does financing make the decision for you?